It’s fair to wonder on what basis we can be sure that the wonderful series of recent paintings by Stewart Goldman, curated by Aaron Cowan, are landscapes. Many are horizontal—some even lusciously elongated—but not all. The artist has provided a number of keys to help us see the landscape elements that inspired these mostly non-representational paintings. 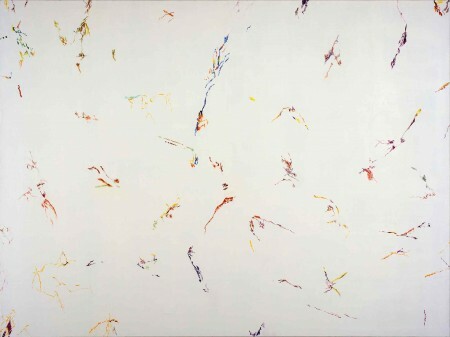 On Goldman’s web page, he calls these his “White Paintings”: they are expanses of linen painted white on which small knots and networks of vivid color have been placed, most of them, as Clement Greenberg might have said of them, more than lines and less than forms. The paintings are landscapes without the land. On the face of it, foreground and background have been taken away, leaving us on our own to orient ourselves in the white space. There is virtually nothing like a horizon line. They are landscapes relieved of gravity. In several of them, it is as if the extraordinarily colorful paint of a Fauvist landscape has been released and floated free of familiar objects to rearrange itself sparingly but freshly on Goldman’s canvases. It is perfectly reasonable to say that these are paintings of trees and branches that are not there. But this does not really help capture the paintings’ quiet but resonant power. It has taken Goldman’s remarkably exacting draftsmanship to evoke all the things that have been left out. For all their flat, white spaces, these are extraordinarily well-drawn paintings, meticulously hand-crafted. They are, mostly, large-scale, and when you look at them, they are both inviting and forbidding, large enough to make you feel as if you can walk—or plunge—right into them, but it is never clear where you could put your feet. Though virtually all of the paintings basically originate in a small handful of photographs Goldman took three years ago in Wai-O-Tapu, a thermal park in New Zealand, I did not feel that the series really explored a sense of place. In true modernist tradition, the place that matters is the canvas, and each one is rich in visual ideas and sensual detail. “Daphne’s Woods” (2013) is one of the earlier paintings in the Wai-O-Tapu series, and is one of the most “readable.” The painting presents a coherent landscape turned almost completely into line. Goldman’s line is febrile and jumpy—throughout the show, the marks he makes on the canvas seem to have lives of their own. The colors are brilliant, even dazzling, but very dry; he paints, in this series, largely without solvent or medium. The colors become increasingly complex by being set next to each other, calling to mind something more like mosaics than the more usual symphonic wash of oil and turpentine. In some of the earlier paintings in the series, the painted lines and forms occasionally overlap, but by the end, richness of color is achieved almost entirely by juxtaposition. “Daphne’s Wood” introduces the motif of the criss-crossed tree trunks that will dominate many of the paintings in the series, first by being drawn and then later by not being drawn; several of the most evocative of the paintings have in their foregrounds large Xs of ghostly white space. 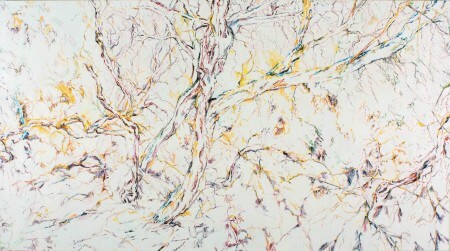 The smaller branches of the trees become loose but dense networks of interlocking lines which hold in place small areas of white like monochromatic pieces of stained glass. The skeins of paint secure the larger shapes in space, as if they have gotten tangled up in a spider’s web. This is a landscape that suggests the intersection of the figurative and the non-figurative. To evoke Daphne in the title is to call to mind the Ovidian nymph pursued by Apollo who is saved (“saved”?) by being transformed into the laurel tree. You are free until you are encased, bound, confined. It does not seem out of line to suggest that Goldman in part is envisioning landscape as what you get when human presences merge with the more unforgiving aspects of the natural world. “NZ-2” (2013) suggests where the series as a whole is headed. Though its most remarkable feature is a large wash of yellow, it is one of the last places in the series where a painted space competes with drawn ones. Mostly, chiaroscuro will be giving way almost entirely to line. And even the lines are being sacrificed. Fewer of them intersect, unraveling to release more and more of the white space. The lines don’t even serve as conventional outlines. Smaller ones are indicated by their absences: Goldman paints on either side of plain, white spaces often no wider than a toothpick, and those are his linear markings. Larger forms are as much intuited as seen. We sense the ghost of large tree trunks because larger white empty spaces interrupt the colorful business of other lines. It is a little like modern astronomy, where distant objects are not exactly visible, but cause a disruption in what we can see. In part, Goldman is redefining chiaroscuro, only now the shadow is the white. In an interesting decision, Goldman has mounted two groupings of framed shadow boxes in which the photographs that served as sources for the paintings are printed, sometimes in silver and sometimes in blue, on aluminum plates. These are the backdrops for miniaturized photographs of the paintings printed in color on clear plexiglass. Sometimes the photographic image seemed almost clinical, like a radiological image of the bone structures that underlie the more delicate soft tissues of the painting. It seemed to me that some of the photographs were printed conventionally and that some were printed as negatives, blurring, as the paintings themselves do, the distinction between a thing and its opposite, between a tangible thing and the shadow that it casts. I wondered at first whether the magician was showing too much about how he does his tricks. It is hard not to view them as interpretive keys, leaving the audience to seek out which painting has been shrunken down to which shadow box. I certainly felt that they were crowded too closely together to be taken as wholly autonomous works. But they helped keep our thoughts focused on the ways the paintings were generated out of ideas about landscape, and served as a steady reminder of how much was being left out. Landscapes—and paintings of them—are filled with potential distractions, and there is something single-minded and possibly even heroic about how Goldman has avoided them. The smallness of the shadow boxes, certainly when compared to the elegant largeness of many of the paintings, reminds us of the malleability of scale. At least a couple of the paintings (“NZ-3” and “NZ-8”) are squared off like a Renaissance cartoon for a ceiling-sized fresco. But more often, I thought, scale was meant to be felt as more organic than mathematical, indicated by whether the collection of marks or nodules were never more than a hand-spread apart (as they are in “NZ-9”) or were more isolated from each other against the white. 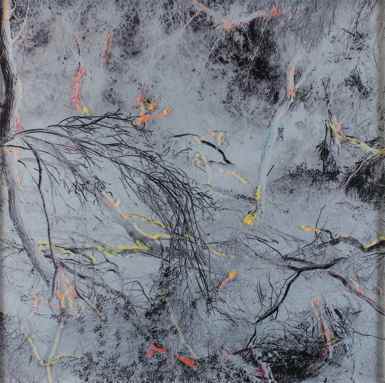 Like the implied figures in “Daphne’s Woods,” this seemed a way for Goldman to keep an implied if ghostly figurative presence in his abstract landscapes, measuring the painting against the body. In his 1921 poem “The Snow Man,” Wallace Stevens suggests that the artist is the figure in the landscape who, “nothing himself, beholds/Nothing that is not there and the nothing that is.” In some of the most fully realized of his recent paintings like “NZ-7” (2014), Goldman explores the creative tension between what is and what isn’t there, and raises important questions about each. He has mastered a visual syntax now virtually freed from the natural objects that inspired it. There is less and less landscape to anchor the painter’s marks. In the upper central portion of the canvas, there is a shape that is recognizable from a couple of other of the paintings: a slender diagonal tree, indicated (as usual) by its absence, but outlined in blue and partly enveloped in orange. Is it the sky on fire? A burning bush? Once again, at the center are the thick, criss-crossed branches, suggested by the lines that indicate that they are not there. It seemed to me that Goldman’s work is powered by his conviction that there is a spiritual dimension to both presence and absence. Are things taken out because they don’t matter (one common argument about abstraction), or are they being held back precisely because they do? as if I were climbing the rocks (white), and the colors were the interstices between them. Sometimes, in my abstracts, people tell me of something figurative that they see, and this annoys me. I hope my comments do not strike you in that same negative way. I also liked Jonathan’s write up a lot for explaining things and nothings. Thanks so much for arranging to take us there.